This dish was inspired by the Charlie Chan Chicken Pasta from a chain called Yellow Cab Pizza, which was my favorite pizza restaurant back home. After eating the dish so many times, I decided, why not experiment and make my own version? Since I don’t have access to my usual ingredients (ie. my favorite brands back home), I have standardized this recipe using as many items as can be found in a common German supermarket. 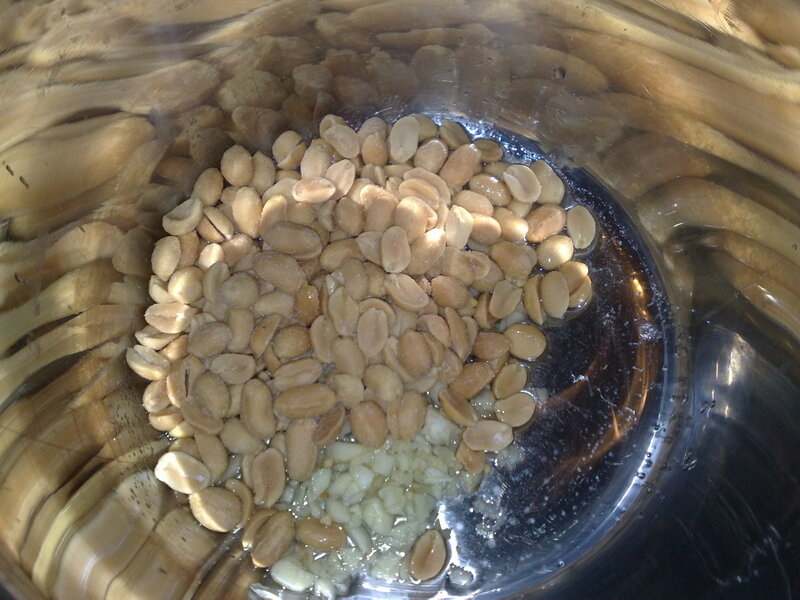 Sautee the peanuts and the garlic in the vegetable oil and 1 tsp of sesame oil until the garlic is golden, but not brown. 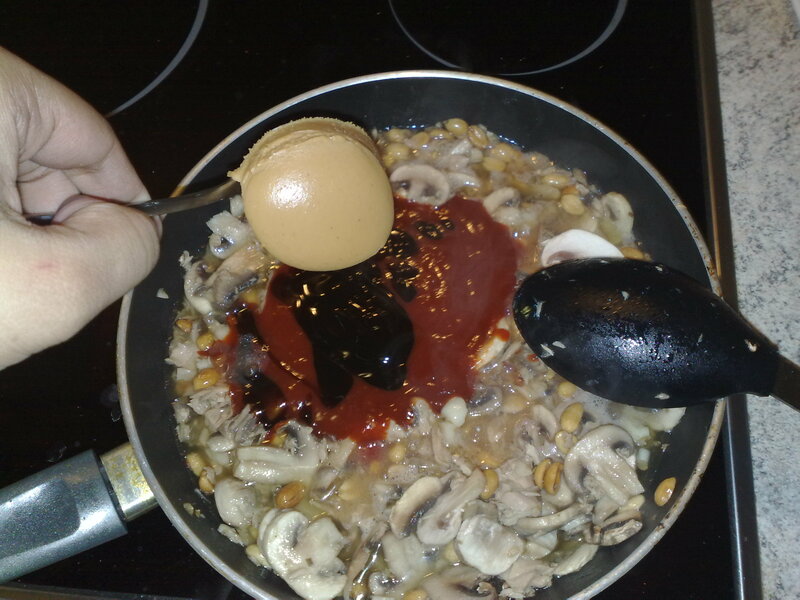 Add mushrooms, chili, barbecue sauce, oyster sauce, peanut butter, and water. Mix well. Add sugar, salt, and pepper. Simmer at low heat until sauce thickens. Adjust flavor to your own liking. Remove from heat. Add in chopped bell peppers and 4 teaspoons of sesame oil. Mix well and let the sauce rest for about 5 min. Mix sauce with some pre-cooked fusilli pasta. Garnish with additional roasted peanuts and chili flakes. Serve with crisp bread, preferably sesame crackers (Sesam Knäckebrot). I had the hardest time standardizing this dish, especially since (A) I’m not used to measuring anything and usually just go by taste, and (B) It’s so hard to re-create the actual flavor of the pasta using German ingredients! 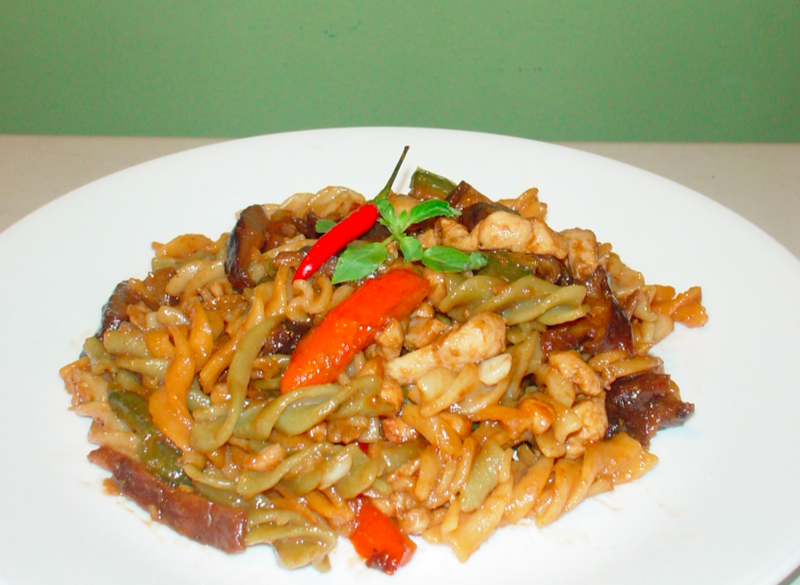 Even this “Euro-version” of my signature pasta dish, although close to the original, still isn’t IT. Nevertheless, this version is still a crowd-pleaser. I used a large amount of sugar for the sauce simply because peanut butter and barbecue sauce here in Europe just aren’t sweet enough. In the Philippines, I had favorite brands of BBQ sauce and peanut butter that didn’t need further sweetening. (If those back home can guess it, you can actually nail this dish :p) An alternative to the tomato-based BBQ sauce is any kind of java sauce or peanut-based BBQ sauce found in Asian foodstores. This dish can be made with canned tuna instead of chicken. This switch makes it easier to cook and is cheaper too. Another alternative is to make the dish completely vegetarian by completely omitting the meat and doubling the amount of mushrooms. For this version, I used fresh large champignons, but I would usually use rehydrated shiitake mushrooms due to their meaty consistency. 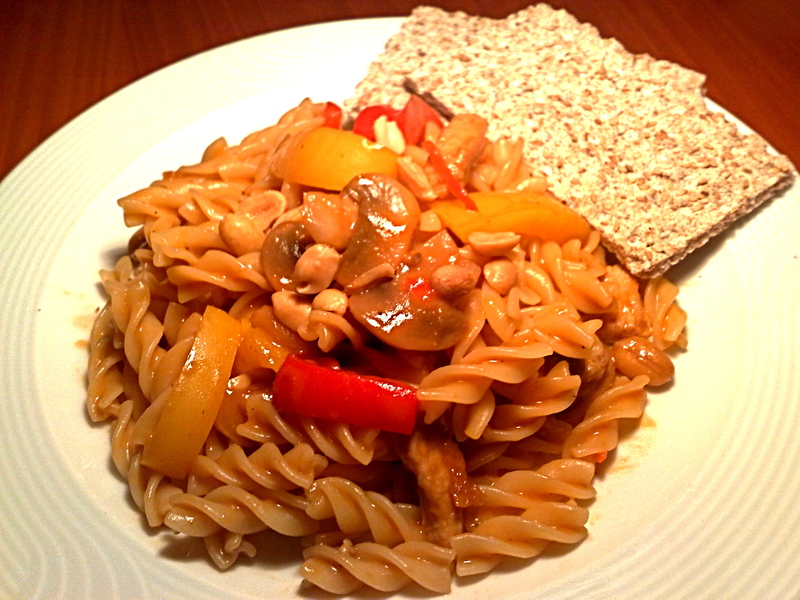 Since the sauce will be very thick and flavorful, it is highly recommended that the sauce be pre-mixed with the pasta. The pasta should only be lightly coated with the barbecue sauce. Smaller pasta types with a high surface area are also recommended (eg. fusilli, spirelli, or penne). The sauce can be frozen and kept for a long time. 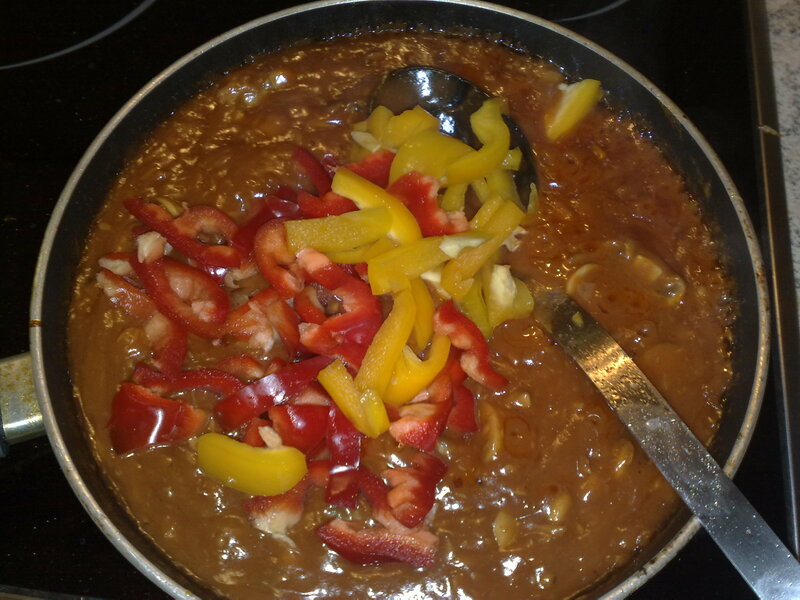 If this is to be done, it is better to just add the bell peppers after reheating. So there you go! Do let me know if you try this at home and if you make any revisions. For my friends who do know the brands I purposely omitted, I trust you will NOT reveal them under any circumstances. Kraft BBQ Sauce seems to be an ok choice. MMMMM! Thanks for letting us in on the secret– or rather, the proportions. I think we have an idea of which brands to use. 😉 Thanks! Yum!